The pickup: It’s citrus season, so I picked up a few grapefruit from my neighborhood grocer. 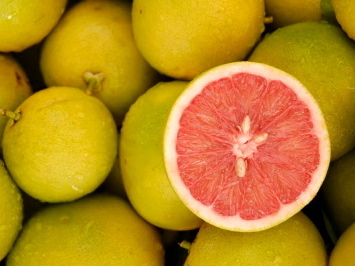 Yellow, red, or a pinkish in-between, I love the bright, tangy flavor of grapefruit; I like slicing one in half and broiling it with a sprinkling of brown sugar for breakfast. The results: This time, though, I wanted to break out of my grapefruit rut. I happened upon a feed talking up a traditional Texas dish of grapefruit pie and later an Epicurious recipe for the same dish. But I’m eating alone this week and knew I wouldn’t be able to (and shouldn’t!) consume a whole pie by myself. So I continued my search until I found a Martha Stewart recipe for grapefruit risotto. The zest was delicious in the risotto. But what to do with the grapefruit flesh itself? I supremed the remaining fruit and paired the slices with slivers of crisp, light fennel and a sprinkling of chopped parsley leaves. Presto! A salad to go with my risotto.